Let flower power help your business brand awareness grow with our Floral Circle sticker design template, perfect for florists, boutiques, resell shops, vintage clothing shops, and many more businesses. Available in three different bright colors, two shapes, and three unique edge finishes, Floral Circle is a fun and whimsical sticker that will catch the fancy of your customers. 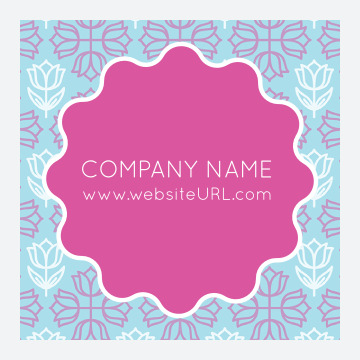 Floral Circle features a bright floral border with the outline of a many-petaled flower in the middle which has ample space for your company name and website URL or other custom message. Personalize your custom stickers today with our online sticker maker! Our online sticker design tool makes it easy to print personalized stickers that feature your own text. Start by choosing your favorite professionally designed template from our design library. Next choose the color scheme that best accentuates your brand. Now point-and-click to add your custom text. When you’re done creating the perfect sticker design, you can generate a free PDF to share with friends and colleagues to get feedback before printing your stickers. PsPrint is the printing partner of choice for thousands of businesses every day. That’s because our customers get amazing products and affordable pricing. Our custom sticker printing services make it easy to save money without sacrificing quality as each sticker is printed on a state-of-the-art printing press using premium paper stocks and vibrant, soy-based inks. We’re so sure you’ll love your stickers, we back every project by our customer satisfaction guarantee! Need help printing your stickers? Our custom printing team is on standby to lend a hand. And don’t forget PsPrint is your one-stop print shop with a full line of other great marketing products including business cards, postcards, posters, and more!